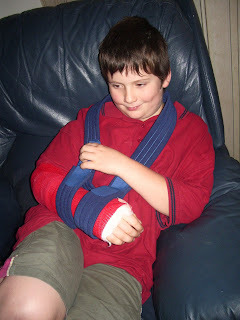 Harrison broke his arm a month ago. A lot of kids break their arms, but this was a bad break for a number of reasons. 1. The bone was completely broken right the way thru. 2. The break was at the top of his radius, i.e. on his forearm up near his elbow. 3. The periosteum (coating on the bone) was about 75% to 80% stripped away. This coating is necessary to supply blood to the bone. Without the coating, the bone dies and stops growing. 4. (To top it all off) He dislocated the bone as well. The doctor put a k-wire (metal pin) in his arm to hold the bones together, then plastered him up. His assessment was that there was about an 80% chance that the damage to Harrison’s arm would cause the bone to die. Four weeks later, they removed the cast (and the metal pin) and did a bone scan. That involved putting Harrison under a camera that could detect nuclear radiation, then injecting him with a radioactive dye that would circulate through his blood, and eventually get into his bones a couple of hours later. By recording how much of the dye was absorbed by his bones, they could tell if there was enough blood supply to his elbow, and whether or not it was healing. The process is amazing to watch. At first the screen is black, because we’re not naturally radioactive. Then as the dye is injected, you see a bright streak on the screen as it passes through the veins to the heart, and then diffuses throughout the body via the arteries in a matter of seconds. The image that is formed is a bit like the one on the left (except that’s not Harrison, just an example I found on google). The good news is that after spending hours getting it, the scan shows that there is plenty of blood flow to Harrison’s injured arm, and he’s going to be ok.
Liz and I are very happy, and grateful to the amazing staff at RBWH. We’ve been in there quite a few times with the kids, and we know that they’re in safe hands. We’re also very grateful for Harrison. He had a precarious start to life, seven years ago, and we almost lost him. He’s beaten the odds again, and we’re so glad he’s here.